The yellow metal finished Wednesday up $15.60, or 1.41%, at $1,123.20 an ounce. 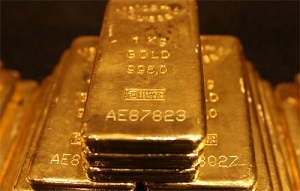 That marked the fifth consecutive session in which the gold price ended higher. Gold prices have now recovered roughly 4% from the five-and-a-half year low of $1,077 hit in July. Fueling this week's gain were mounting concerns over China's devaluation of the yuan. The People's Bank of China (PBOC) devalued its yuan by 1.6% Wednesday. That followed a record 1.9% devaluation on Tuesday. The aim is to boost exports and growth in the Asian nation, which is facing a serious economic slowdown. After several years of double-digit growth, China's economy is expected to grow just 7% this year. The PBOC's moves sparked fears of a currency war and sent global equities lower. The move also drove investors to safe-haven asset gold. The Dow was down as much as 250 points intraday Wednesday before ending the day flat. Markets across Europe and the Asia Pacific finished the day in the red. The Euro Stoxx Index sank 3.11%, Germany's DAX tumbled 3.27%, and the Hong Kong Hang Seng plunged 2.38%. A softer dollar has also been lifting gold prices. The September dollar index fell 1.17 points to 96.165. "The impetus of course has been China and weak stocks," George Gero, a precious-metals strategist with RBC Capital Markets Global Futures, told Kitco. "Commodity traders forget they have to expect the unexpected."